The Hall of Fame's nominating committee selects eight to ten candidates from among the four Contemporary categories (male horse, female horse, jockey and trainer) to be presented to the voters. Changes in voting procedures that commenced with the 2010 candidates allow the voters to choose multiple candidates from a single Contemporary category, instead of a single candidate from each of the four Contemporary categories. For example, in 2016, two female horses (Rachel Alexandra and Zenyatta) were inducted at the same time. 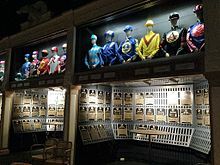 The museum also houses a large collection of art, artifacts, and memorabilia that document the history of horse racing from the eighteenth century to the present. The museum first opened its doors in 1951, at which time it occupied a single room in Saratoga's Canfield Casino. The establishment was supported by the city of Saratoga Springs, which donated $2,500, the Saratoga Racing Association, which donated $5,000, and various patrons of the sport, who also donated various pieces of art and memorabilia. The first item in the museum's collection was a horseshoe worn by the great Lexington. 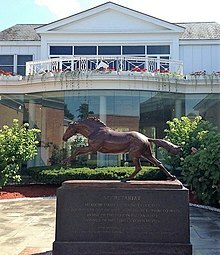 In 1955, the museum relocated to its current location on Union Avenue, close to the main entrance of Saratoga Race Course. Inductions into the hall of fame began at the same time. Since then, the museum has expanded several times to allow for the display of its extensive art collection and more multimedia displays on the history of the sport. In the early years, inductions to the hall of fame were based on the evaluation of a panel of racing historians. In 1955, a group of 9 horses from the earliest years of the American turf were inducted. The 1956 class included 11 horses that raced around the turn of the century, while the 1957 class included 10 horses that raced up to the mid-thirties. Since then, the classes have been significantly smaller as the inductions shifted to more contemporary horses. Under current rules, a horse must have been retired for a minimum of five full calendar years to be eligible for the hall of fame. Thoroughbreds remain eligible in the contemporary category between five and 25 calendar years following their final racing year. Thoroughbreds retired for more than 25 calendar years may become eligible through the Historic Review Committee. Contemporary jockeys become eligible for the Hall of Fame after they have been licensed for at least 20 years, and remain eligible until 25 years after retirement. In special circumstances such as fragile health, the 20 year requirement may be waived, though there is usually a five year waiting period after retirement in such cases. Contemporary trainers become eligible for the Hall of Fame after they have been licensed for at least 25 years, and remain eligible until 25 years after retirement. In special circumstances such as fragile health, the 25 year requirement may be waived though there is usually a five year waiting period after retirement in such cases. The Museum Collection includes just over 300 paintings. These range from paintings of the early days of racing in England by John E. Ferneley, Sr. to more contemporary champions by Richard Stone Reeves. Featured artists include: William Smithson Broadhead, Vaughn Flannery, Sir Alfred J. Munnings, Frederic Remington, Martin Stainforth, George Stubbs, Henry Stull, Edward Troye and Franklin Brooke Voss. Also on display are Kelso's five Jockey Club Gold Cup trophies and the Triple Crown trophies of Count Fleet. ^ "Racing Hall of Fame changes voting procedures". ESPN.com. 3 March 2010. ^ a b c Goode, Kristen Ingwell. "Racing's Hall of Fame Evolved From Humble Beginnings". BloodHorse.com. Retrieved 9 September 2018. ^ "Hall of Fame: Humble Beginnings (Cont.)". BloodHorse.com. Retrieved 9 September 2018. ^ a b c "Eligibility, Nomination and Election - National Museum of Racing and Hall of Fame". www.racingmuseum.org. Retrieved 4 June 2018. ^ "Hall of Fame - Horses". www.racingmuseum.org. Retrieved 9 September 2018. ^ "Hall of Fame - Jockeys". www.racingmuseum.org. Retrieved 9 September 2018. ^ "Hendrickson New President of National Museum of Racing". BloodHorse.com. Retrieved 11 August 2017. ^ "August Belmont Jr. and Paul Mellon Selected" (Press release). Saratoga Springs, NY: National Museum of Racing and Hall of Fame. 2013-06-05. Retrieved 2014-03-18. ^ "Exhibit Galleries - National Museum of Racing and Hall of Fame". www.racingmuseum.org. Retrieved 4 June 2016. ^ "National Museum to Get Nerud Collection". BloodHorse.com. Retrieved 4 June 2016. ^ "The Museum Collection". www.racingmuseum.org. Retrieved 4 June 2016.